Please note the phone number has changed for DPW. New phone number is (856)854-1176 ext. 6260 or ext. 6262. 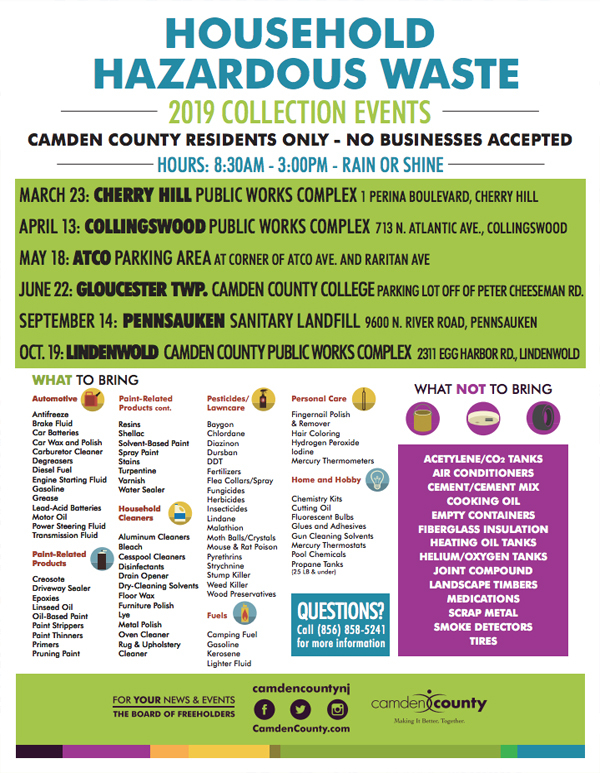 Trash is collected Monday -Thursday by South Jersey Sanitation, except for the following Holidays: New Year’s Day, Memorial Day, July Fourth, Labor Day, Thanksgiving and Christmas. If your trash day falls on an aforementioned holiday, place your trash on the curb for a pick up on the following day. Please be advised that our contractor will make every attempt to remain on schedule for the rest of that week, but subsequent trash days may experience delays. Township water department will be flushing hydrants between the hours of 7 am and 4 pm beginning October 24th approximately through the end of November. You may experience low water pressure during this time and a discoloration. Please run water until discoloration disappears and water runs clear. If you have any questions, please call the Department of Public Works garage at 856-833-6260. Township crews will be making routine weekly collections on all Haddon Township streets. Township residents are encouraged to rake leaf piles weekly into the street, but away from any storm sewers inlets to prevent flooding. Residents can expect leaves to be picked up every 7-10 work days, depending on weather conditions. Additional work crews will be added as we go through the season. Trash, recycling, lawn debris, and brush are picked up on the same day by our hauling company. Lawn debris/grass clippings and brush are taken for recycling April 15th through October 15th, and must be placed in an open container. Trash consists of household waste only, not construction material. Receptacles shall be plastic or metal or bags not to exceed 30 gallons or fifty (50) pounds. Containers or other items to be disposed of shall be placed outside after 6:00 PM of the day immediately preceeding the day of collection. After collection, any empty containers shall be removed from curbside promptly, but no later than 7:00 PM of the day of collection. A maximum of 10 items, not exceeding a total of 300 pounds, may be placed at the curb for regular pickup. Residents undergoing construction, moving, “spring cleaning,” or emptying garages, must contact a disposal company for a dumpster. NOTE: There is a permit application for dumpsters or PODS. 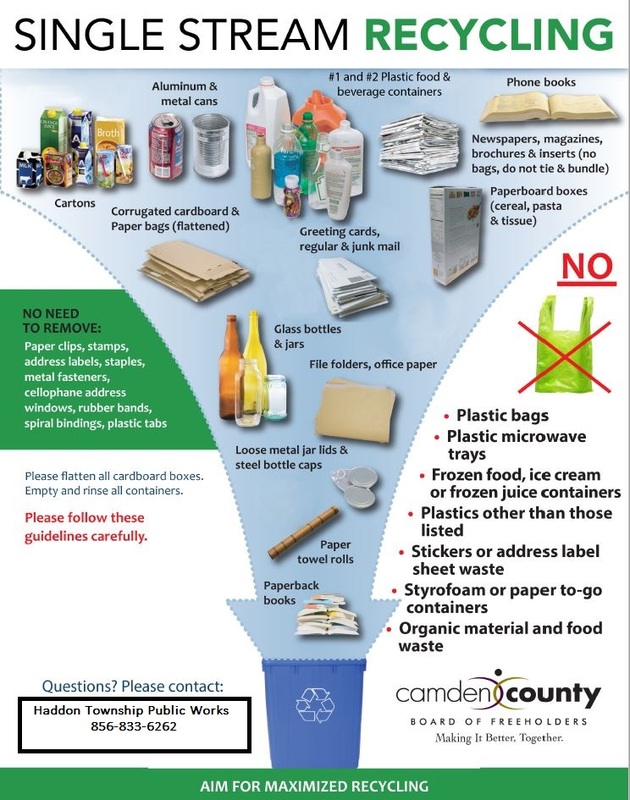 Recycling Guidelines, see flyer below. All “bulky” items waste including, but not limited to furniture, mattress, carpeting, sinks, toilets, doors and windows (up to 3 or 4 units), bundled wood in 4 foot sections not to exceed fifty pounds will be picked up on your regular trash day. Lawn debris/grass clippings and brush are taken for recycling April 15th through October 15th, and must be placed in an open container. 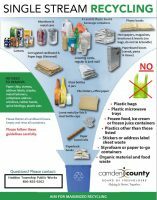 DO NOT USE THE TOWNSHIP RED RECYCLING CONTAINERS FOR LAWN AND ORGANIC DEBRIS. Organic material placed in plastic bags will not be recycled. Brush and branches may either be tied and bundled in 4 foot sections or placed neatly in an open container to facilitate efficiency and the safety of sanitation employees. Township residents are encouraged to rake leaves weekly into the street but away from the curb flow line and any storm sewers to prevent flooding. Latex or Water-Based Paint Disposal: Water based paint can be disposed of with regular trash, provided it is first dried out. For more information on how to dry out water- based latex paint click here. Oil-Based Paint Disposal: Oil-based paint is harmful to the environment if not properly disposed. 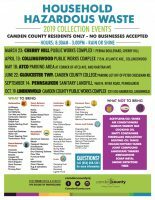 Camden County offers the collection of these paints, as well other hazardous materials on special collection dates, see flyer below. To report a problem during regular hours (Monday through Friday 7:00 am to 3:00 pm), contact Public Works at 856- 854-1176 ext. 6260. During off hours, weekends or holidays, please contact the emergency utility hotline at 609-820-8048. The utility hotline is for water and sewer emergencies only. Report a Pothole at bbrookes@haddontwp.com or by calling the Public Works garage at (856) 854-1176 ext. 6260. By ordinance, the Shade Tree Commission has jurisdiction over all Township curbside trees. All non-emergency issues regarding curbside trees should be directly reported to the STC via email at shadetrees@haddontwp.com.